Polygonal meshes can be created in several different ways. In this paper we focus on the reconstruction of meshes from point clouds, which are sets of points in 3D. Several algorithms that tackle this task already exist, but they have different benefits and drawbacks, which leads to a large number of possible reconstruction results (i.e., meshes). The evaluation of those techniques requires extensive comparisons between different meshes which is up to now done by either placing images of rendered meshes side-by-side, or by encoding differences by heat maps. A major drawback of both approaches is that they do not scale well with the number of meshes. This paper introduces a new comparative visual analysis technique for 3D meshes which enables the simultaneous comparison of several meshes and allows for the interactive exploration of their differences. Our approach gives an overview of the differences of the input meshes in a 2D view. By selecting certain areas of interest, the user can switch to a 3D representation and explore the spatial differences in detail. To inspect local variations, we provide a magic lens tool in 3D. The location and size of the lens provide further information on the variations of the reconstructions in the selected area. 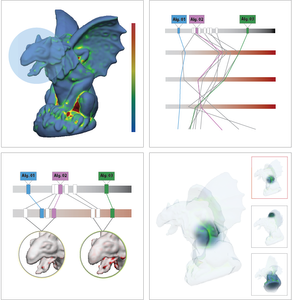 With our comparative visualization approach, differences between several mesh reconstruction algorithms can be easily localized and inspected. abstract =   "Polygonal meshes can be created in several different ways. allows for the interactive exploration of their differences.